NAZA TTDI Sdn Bhd, the property development arm of Naza Group, plans to launch 18 new projects this year with a combined gross development value (GDV) of RM1.6 billion. Naza TTDI chairman SM Nasarudin SM Nasimuddin said the launches are part of its long-term plan to become one of Malaysia's top 10 property companies in the next three years. "We also plan to launch our projects outside of the Klang Valley and make our maiden venture overseas such as in Singapore, Vietnam, Indonesia and China," Nasarudin said at a briefing on its financial performance in 2010 and outlook this year in Shah Alam, Selangor, yesterday. 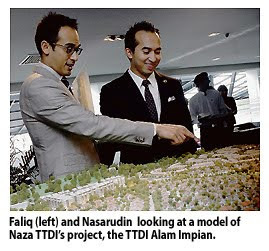 Group managing director SM Faliq SM Nasimuddin said the new projects are expected to increase Naza TTDI's net profit in 2011 by 22 per cent to RM100 million from RM82 million in 2010. Group turnover this year is targeted to hit RM1 billion, up 57.5 per cent from RM635 million in 2010. Faliq added that the company hopes to rake in a net profit of RM267 million and a turnover of RM2.2 billion by 2015. "In future, we hope to form joint ventures or embark on merger and acquisition plans with companies that have strategic assets and landbanks as part of our expansion plan at home and abroad," said Nasarudin. He said the company aims to boost its landbank to over 200ha in the next two years from 161ha currently. The project launches this year will comprise both residential and commercial developments such as TTDI Grove in Kajang, TTDI Alam Impian in Shah Alam, TTDI Dualis in Puchong, as well as a 35-storey tower in Jalan Tun Razak, Kuala Lumpur. The company has also formed an associate construction company, Naza TTDI Construction, as it feels it is the right time to start diversifying and entering the construction business. Naza TTDI Construction will complement Naza TTDI's business, offering complete construction services in the fields of building, civil engineering and infrastructure works. On its RM650 million Matrade International Exhibition Centre, Nasarudin said piling works are ongoing and it will call the media for an update in June. He added the company has no plans to go for a listing yet but may do so in the future, should the need to raise funds arise, coupled with right stock market conditions. Established 37 years ago, the Naza Group, which also has operations in automotive, hotels and food, has completed more than 14,000 residential and commercial units, including in Taman Tun Dr Ismail, Petaling Jaya, Section 13 Shah Alam and the Platinum Park in Kuala Lumpur City Centre. SHAH ALAM: Property developer Naza TTDI Sdn Bhd plans to launch 18 new property projects with total gross development value (GDV) of RM1.6bil this year. Chairman SM Nasarudin SM Nasimuddin said the new projects were expected to increase the group's net profit this year by 22% to RM100mil from RM82mil last year. “Having said this, the group's turnover this year is targeted to hit RM1bil, up 57.5% from RM635mil in 2010,” he said yesterday at Naza TTDI 2010 Performance Review & 2011 Plans event. SM Nasarudin added that these new launches would comprise both residential and commercial developments such as TTDI Grove in Kajang, TTDI Alam Impian in Shah Alam, TTDI Dualis in Puchong and a 35-storey tower at Jalan Tun Razak. “This year's launches are in line with our aspirations to be among the top 10 property developers in the country over the next three years,” he said, adding that by 2015, the group was targeting to achieve a net profit of RM267mil and turnover of RM2.22bil. Meanwhile, group managing director SM Faliq SM Nasimuddin said in addition to the new launches, Naza TTDI had also established an associate construction company, Naza TTDI Construction (NTC). “This company will complement Naza TTDI's business and offer complete construction services, specialising in the fields of building, civil engineering and infrastructure works,” he said. SM Faliq also said the group was looking at expanding its land bank locally and regionally over the next few years. The group currently has an existing land bank of over 161.87ha in Malaysia. “Apart from that, we are also looking at the potential of penetrating other markets in the region such as Singapore, Vietnam, Indonesia and China with high-impact and high-visibility projects that will provide the necessary profile to propel us into the global property market,” he said. LBS Bina Group Bhd, well known for building affordable homes, wants to reposition itself as a builder of high-end property, an indication that demand for expensive properties is still strong. The small property developer with a market value of about RM228 million plans to focus on the medium-high to high-end market segment to earn better profit margins. "We are transforming ourselves. 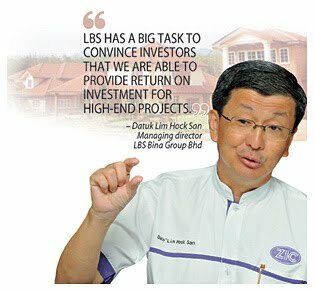 We need to make profits as we are answerable to shareholders," LBS Bina managing director Datuk Lim Hock San told Business Times in an interview recently. Property prices in certain parts of the country and especially the Klang Valley have been rising strong, helped by cheaper loans and easy purchase schemes offered by developers. Last year, Bank Negara Malaysia had to set a limit on loans for those wanting to buy more than two houses as it sought to curb speculation. Spearheading LBS Bina's brand in the high-end market will be its jewel project called D'Island Residence in Puchong - an eight-year project with a gross development value (GDV) of RM2.9 billion. Overall, the D'Island Residence will be developed on 175 acres and once completed, it will have a total of 237 units of super-link house, 298 semi-detached units, 148 bungalow units and 352 high-end condominiums as well as commercial units. The signs are good as during the soft launch recently, 51 units of super-link houses were sold. The official launch is in April 2011. It also plans to launch 122 units of super-link houses that cost just below RM1 million each and 74 units of semi-detached houses at above RM2 million. A property analyst said most developers are now pricing in higher land and development costs into selling prices to sustain profit margins. The key items that have risen significantly are land and construction materials, especially steel. "Of course LBS Bina has a big task to convince investors that we are able to provide return on investment for high-end projects. Location will be a key element as well," Lim added. Still, LBS Bina will continue to build affordable homes pegged below RM350,000, albeit at a redu-ced scale. The group has been building affordable homes at Bandar Saujana Putra - its flagship development spanning over 835 acres. This self-integrated township was first launched in February 2003 and LBS Bina has handed over more than 5,000 units of various types of properties since then. This year, the group plans to build 60 per cent of houses priced above RM350,000. As of March 3 2011, LBS Bina had sold properties worth RM121.7 million and 83 per cent of them were in the medium-high segment. LBS Bina shares fell 3.3 per cent to close at 59 sen yesterday. KUALA LUMPUR: The average prices of newly developed residential property this year is expected to grow by 13% against last year in line with the increase in raw materials cost, according to a survey by Real Estate & Housing Developers' Association Malaysia (Rehda). The survey showed that the average terrace house in Malaysia last year had gone up to RM176,590 in the third quarter from RM168,667 in the first quarter. High-rise property price in the same timeline had gone up to RM165,530 each from RM163,300. Rehda president Datuk Seri Michael Yam said since a year ago, raw materials prices such as steel and cement had increased significantly. “Generally, the majority of the survey respondents are optimistic of the property market for the next six months as the overall sentiments governing the market are positive,” he said at a media briefing yesterday. Meanwhile, for new properties in the Klang Valley, Rehda national treasurer Teh Boon Ghee said they might rise around 15% this year. “But, it is also interesting to look at this price increase from a different angle as 88% of the transactions in 2009 were from the secondary market and only the remaining 12% came from new development. The 13% and 15% expected increase only applies to new homes while the momentum for secondary market is slower than that,” he said. On the new home loan guideline by the Government under My First Home Scheme, Yam said although Rehda supported the move, it would be challenging to develop houses priced between RM100,000 and RM220,000 in the Klang Valley and Penang. “In these developed urban areas, it would be impossible to develop anything below RM200,000. “This is because the land costs in these areas are very high. The land component out of the total development cost in these areas may be around 40% to 50%,'' he said. For comparison, the land cost per sq ft in Sungai Petani is RM1.30, Cyberjaya RM36 while in Kuala Lumpur, it could be as high as RM2,000. But due to the new guidelines, Yam said developers might have to relook at their unit size if the development was in the Klang Valley. “At the average price of about RM400 per sq ft, they can develop a 500 sq ft studio unit or a one-bedroom apartment. This is actually the trend in most developed cities around the world. But to enable developers to embark on this, the Government must encourage local authorities to review their Planning Act as it is now based on number of units per acre. “Let's say, the authority allows a developer to build only 50 units per acre. Would it build 50 units of 500 sq ft houses or 50 units of 2,000 sq ft houses?” he said. The survey were answered by 135 or 14% out of 972 Rehda members that comprises of housing and property development companies from all 12 states in Peninsular Malaysia. Property developers are upbeat that they will do better with hints of better market conditions ahead due to the Economic Transformation Programme (ETP). More developers will be launching new projects nationwide in the second half of the year, findings by the Real Estate and Housing Developer's Association Malaysia (Rehda) showed. These include terrace houses, condominiums and apartments priced from RM100,000 to RM500,000, and service apartments, semi-detached houses and bungalows worth RM500,000 to more than RM1 million. The survey showed developers will raise the prices for new houses by an average 13 per cent this year. Some have indicated their prices may rise by 20 per cent to 50 per cent, depending on the locality of the projects. Rehda president Datuk Seri Michael Yam said while the housing market may have strong underlying demand due to the country's demography, young population, and now the ETP, the pressure of increased building materials, labour costs and land prices pose huge challenge to industry players. The survey had 135 developers responding to market conditions in 2010 and their outlook for 2011. Fifty-nine per cent of them said the ETP is expected to add value to their developments. Rehda national council member NK Tong said despite the price rise, he believes demand for new houses will be higher. "People will buy in anticipation of a brighter economy. People who are trying to predict the property market will have to view the local and global economy, which for this year looks positive," Tong said. The ETP aims to generate RM76 billion for the country by 2015. Since the launch in October 2010, the government had announced 60 projects, including the Mass Rapid Transit and the greater Kuala Lumpur Light Rapid Transit extension. The government is aiming for a population boom in Greater Kuala Lumpur/Klang Valley (Greater KL/KV) to 10 million by 2020 from the current six million, with foreigners making up some 20 per cent of the population. Tong said the additional 1.6 million foreigners expected in Greater KL/KV by 2020 from the current 540,000 will help boost property sales. I-BERHAD, an integrated ICT developer, aims to launch a mixed real estate investment trust (REIT) worth more than RM1 billion in four to five years. The idea is to unlock the value of investments at i-City, the company's 29ha knowledge and tourism hub in Shah Alam, Selangor. I-Berhad chief executive officer Datuk Eu Hong Chew said the REIT will comprise data centres, an office tower, hotel, mall and carpark block. "We are growing our property portfolio. 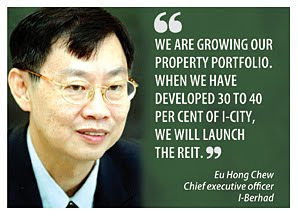 When we have developed 30 to 40 per cent of i-City, we will launch the REIT," Lee told Business Times recently. I-City, the first private initiative to be awarded the Malaysian Super Corridor Cybercentre status, is currently 20 per cent developed. The project started in 2005. The company has so far built cybercentre office suites, data-centres and innovation centre with a combined 500,000 sq ft of space. Al Rajhi Banking Group owns 200,000 sq ft of the space and the rest have been leased to multi national firms and small- and medium-sized enterprises. Lee said I-Berhad will double the existing 1,000-bay carpark block within the next two years to enhance its value. It has RM50 million in cash to fund the construction of new properties for the next three years. Lee added that the company will not borrow from banks at this point. It plans to plough back future profits for its investments in i-City. The company, helmed by its executive chairman Tan Sri Lim Kim Hong, aims to be profitable in fiscal 2011 with expected growth in all its three divisions - property development, property investment and tourism. For the nine months ended September 30 2010, I-Berhad posted a net loss of RM1.73 million on revenues of RM6.4 million. State-owned investment fund Permodalan Nasional Bhd holds 20 per cent of I-Berhad. Malaysian REIT manager Axis REIT Management Sdn Bhd is set to list the world’s largest Islamic real estate investment trust valued at over RM3 billion ($988 million), three sources with direct knowledge of the deal said on Friday. Axis REIT Management, which also manages Axis REIT, is now conducting book building for the Axis Global Industrial REIT, said the sources who asked not to be identified as they are not authorised to speak to the media. The REIT will manage 33 properties located in three Asian countries including Australia and Hong Kong. Some of the assets were bought and leased back from Australia’s Goodman Group. Axis REIT’s chief executive officer Stewart LaBrooy declined to comment on the deal when contacted by Reuters. The deal’s principal adviser is Malaysia’s CIMB .